Despite being occasionally tempted by Lidl's bargain-price offering; I am looking to buy a decent 'intelligent' charger. Does anyone know how good they are, please ? Note: I dismissed the Lidl charger when I read the instruction manual, which requires the battery to be disconnected from the vehicle when trickle charging !! Having spent 4 years (in Canada) developing battery chargers and clever charging algorithms, it certainly looks credible in terms of the charge profile (look at the bottom of the datasheet where it says "charging steps" . How well they have managed to give it enough intelligence to adequately identify what it is connected to is less obvious. It's notoriously difficult to tailor the charging algorithm to unknown batteries although of course everyone knows that if you could do so, you'd have a very interesting product. That would be the holy grail of the battery charging world and so far nobody has found it despite decades of research and hundreds of patents. Reading the data sheet on this product does not inspire confidence. Under 12V NORM it says "For charging 24-volt, Wet Cell, Gel Cell,"
Under 24V COLD/AGM its says "14.4 volts 900ma." Under 6V NORM it says " For charging 12-volt lithium-ion batteries, "
I spent [wasted ?] a lot of time yesterday trawling the internet ... The choice seems to come down to that one or the comparable CTEK model. CTEK's website is more informative, but the NOCO charger is more versatile. It's lawyer speak. I have smart / multistage chargers from Race Tech, Mascot, Optimate, C-Tek and Lidl in use for a decade or more, connected for upwards of 6 months of the year to my fleet when laid up over the 'winter months' I might at some point have read the instructions but regardless I've never disconnected the battery to charge it. Thanks Martin: But I pay attention to 'lawyer speak' ... especially when it provides caveats covering "this might spike the ECU in your car"
Both CTEK and NOCO explicitly state that the chargers are safe to use with the battery connected to the vehicle. It may not be a name that s in common use with car owners but Oxford Battery chargers are used a lot in the motorcycle world. They do operate on car batteries as well. Not cheap but I've been happy with mine. Michael, I have used a Ctek charger for over a decade, and I'm very satisfied with mine. I've had one of these for about six months and find it does everything I need. Mainly for maintaining charge on the campervan while not being used but it will also charge a flat battery quickly, including the 24 V one in my wife's mobility scooter. "this might spike the ECU in your car"
Vehicle electronics are by design extremely robust. 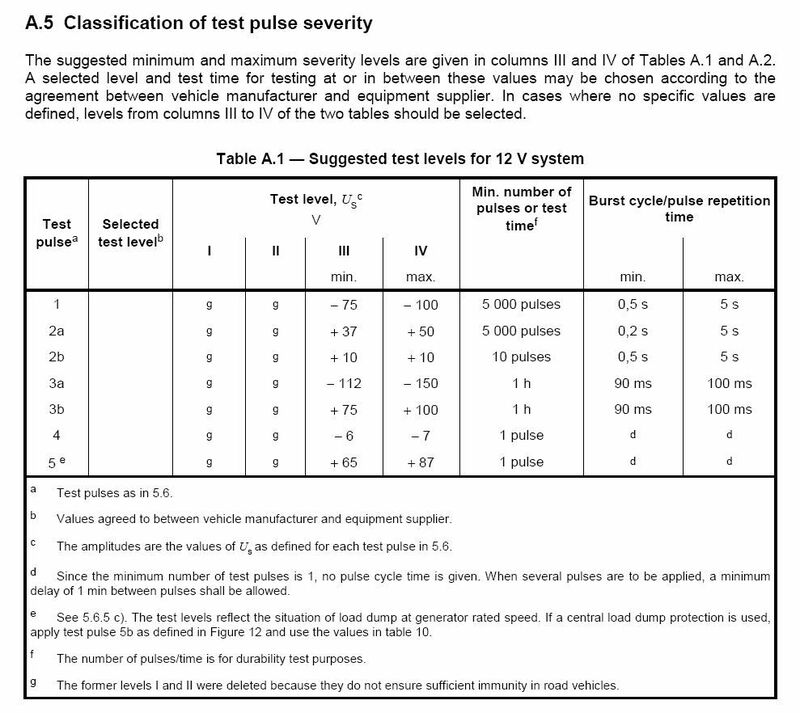 One of the tests in the ISO Standards (3a) imposes 100ms pulses at minus 150v for an hour and another (3b) at the same rate and over the same period but at +100v. That's to the exact same supply terminals on your ECU as your battery (and charger) is connected to. The upshot is anything that can't cope with a smart charger connected is only fit for the scrapheap! Michael, here in Namibia we can get the CTEK types, and an internally identical charger called 'Pro-User'...(!) made by Precision Enterprise. I have two of the PSA-004, one on the house alarm battery (a Gel-Cell, 50Ah type) ,and one on my Truck ( a deep discharge 120Ah wet cell type) which does not travel much. A variety of previous chargers destroyed the batteries due to overcharging , even thought they were supposed to be trickle charge capable. The PSA-004 have been in service for 5 years, and I never had to replace either battery yet. I do recommend these - perhaps you can dig around there and see if they are available in the UK? Price was very good - a bit more than 1/3 of the equivalent model CTEK. I got a smart charger from Halfords, this seems to be the current version, it works fine both for caravan and car batteries even from flat. Thanks for all the alternative suggestions ... and special thanks to Joe for his closing remark. I was a little wary about NOCO, based mainly on a distaste for their "Wicked Smart" tag. That was clearly illogical; which is why I asked the question ... I was hoping someone would tell me they were beautifully built with conformal-coated boards, etc. and worked impeccably. It's a pity, because the claimed specification is right there in my 'Goldilocks Zone'. I bought one of the Lidl ones and noticed an immediate and dramatic increase in the capacity of the leisure battery I use to power the ~50W cooler on my camera. Having used it in sub-zero conditions I had noticed the end voltage was getting lower and lower - below 11 volts which is not ideal. Swapping the Lidl unit for my 'basic' charger the last time I ran it all night (OK not as cold) the voltage was still well above 12.5V. I suspect it is 'filling' the battery properly more than any thing else. If the Lidl one detects a battery with low voltage, it does some short conditioning charges and measures the voltage rise to decide if its a 6V or 12V battery. If you want to charge other than high-capacity lead acidf batteries, the best solution is an iMax B6. There are lots of 'clones' about and I suspect mine is one, but if you have the patience to run two 5-cycle conditioning runs it can recover most of the capacity in >15 year old NIMH pack and do almost as well for Nicads. It also does LiONs and a great job of charging my 7Ah gel batteries. Unfortunately I doesn't go up to 19.2v, which is what I need to try and recover my Sealey impact gun battery. I'm guessing the best approach will be to open the case and treat it as a 12v + 7.2v in series and cycle it in two parts. I agree with Neil. I also use an Imax B6AC Pro, it handles my 5000mA 6S LiPo packs easily (nominally 22.2V) so your 19.2V battery should fit within the specifications. The fact that it can balance charge/discharge/storage charge these packs is important to me, as well as charging/cycling my lead acid and LiFePo batteries.